It’s that time. You’ve started your school supply shopping and you’re finally starting to see the light at the end of that summertime tunnel. Every year, to celebrate the first day of school, I let my kids pose in the driveway while I snap their photo. I admit it, I never really do anything cute, but this year I wanted to try to jazz up their first day back with a memorable photo. Now I just have to decide which of these five adorable first day of school photo ideas I should choose! 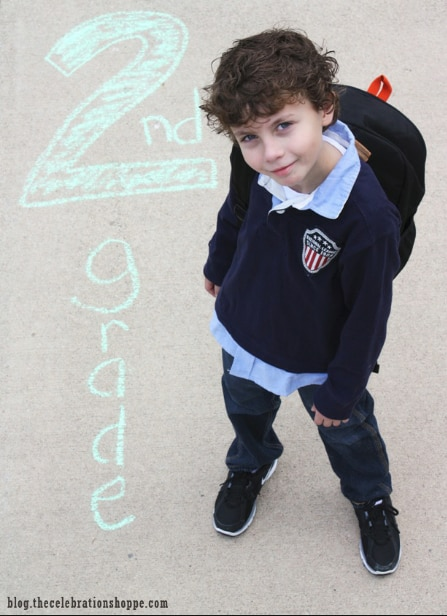 This is, by far, the simplest photo idea — and it requires sidewalk chalk, something you may already have in your home. Just draw your child’s grade in school on the driveway or sidewalk, have them stand next to it, and get ready to snap photos. For this one, you may need to stand on a chair to get the entire drawing and your kiddo in the picture! 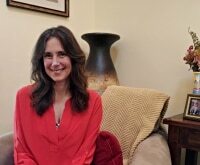 Check out how this photo op turned out over at the Celebration Shoppe. I was walking through Target the other day and I saw a small chalkboard that said “first day of school.” I wish I had picked it up! But I didn’t and now they’re all gone. Luckily, though, I don’t need a pre-printed chalkboard to create a chalkboard sign for my kids’ first day back. All I need is some black paper mounted on cardboard, then I can draw on it like a chalkboard and snap the photo. 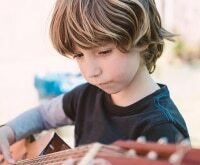 Find out how this photo idea turned out at Educents. If you’re not artsy, no worries. There are a lot of free printables online that you can print out. You can even find some printable props like big glasses, silly hats, and a stack of books. Let your creativity run wild with some printables to set the tone, like these adorable photos from Living Locurto. OK, so, your first day of school photos don’t need to be quite so controversial, but there’s nothing wrong with having a little fun and taking a funny photo. Get your kids involved so everyone has a good laugh. 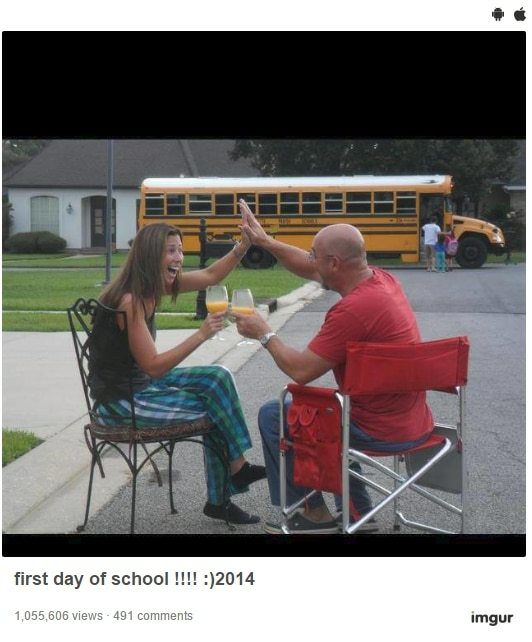 Some ideas I thought would be fun were mom and dad sharing mimosas while the bus picks up the kids and mom jumping for joy. You could even reverse the roles and take a photo of your kids on the front porch waving goodbye to mom or dad. 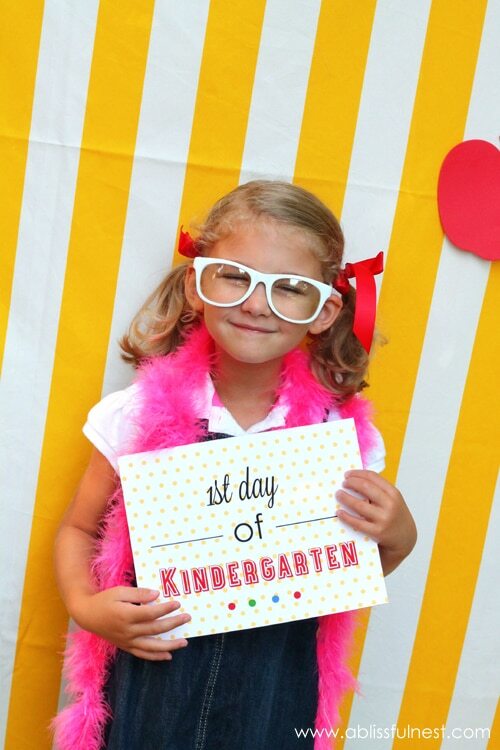 Find more tongue-in-cheek first day of school photo ideas at the Mirror. 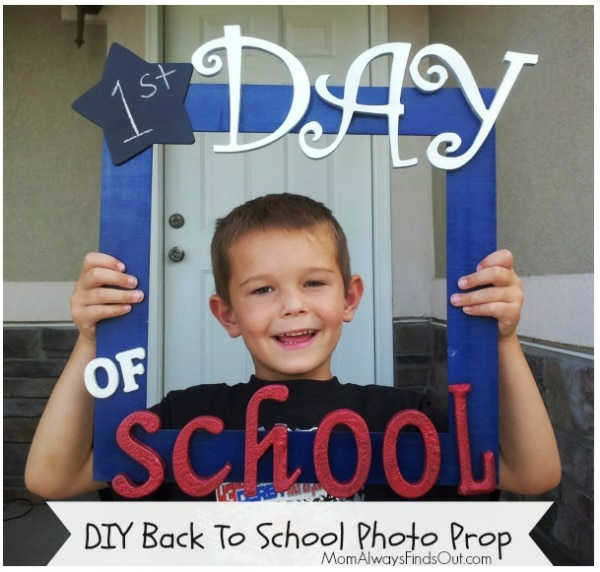 All you need for this fun photo is a wooden frame, some paint, and some artsy letters. If you do it right, you can even keep using the same photo frame year after year. Just imagine being able to compare 12 years’ worth of photos and seeing how much your child grows every year. See how it turned out at Mom Always Finds Out. Your turn! 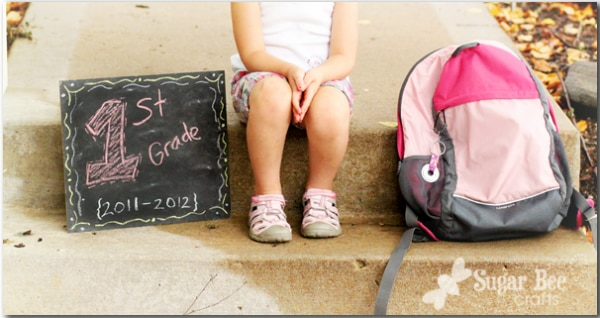 Do you have a creative first day of school photo idea ready for the big day? Share it with us in the comments below!